Acoustic panels are panels that absorb sound and are highly effective acoustic solutions for sound absorption and noise control for many different types of applications. Acoustic panels provide the perfect sound absorption materials for deadening and dampening sound in restaurants, offices and many more spaces. Acoustic Panels supplied by TOP SURFACE, are the ideal solutions for a variety of applications including Offices, Conference Rooms, Home Entertainment, Home Theatre Music rooms, Auditoriums, Teleconferencing, Videoconferencing, Broadcast and Recording Studios, Theatres or anywhere that needs a quick and effortless acoustical solution. Our acoustic panels install quickly and help absorb disturbances, reduce echo and improve sound clarity. Our acoustic wall panels are high performance products that are used to reduce ambient noise levels and excessive reverberation in any room. They can be positioned directly on a wall or ceiling, and come in various colors and thicknesses. They are available in an array of different colors, surface patterns, and thicknesses. These acoustic panels may be used in public and private facilities. Our indoor – acoustic panels are made from high grade materials for optimum noise reduction and durability. Whether it is building noise barrier walls, targeting noise emitted from heavy industrial equipment; Whether you are looking to reduce noise or create better sound in an amphitheater, we supply and install a range of acoustic products that are ideal for your application. All of the acoustical products in this range have been developed to meet the specific requirements of residential, commercial and industrial acoustics. If you want to soundproof a space and at the same time wish to have a solution that gels with your décor, there can be no better choice than TOP SURFACE acoustic panels. Polyester Acoustic Panels use recycled content to create acoustic sound panels. 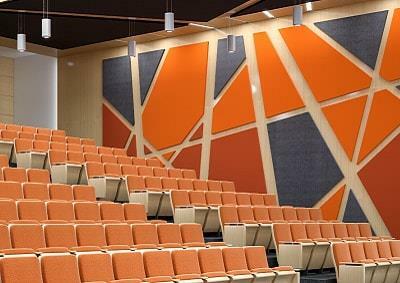 Acoustical foam is a lightweight, fiber free alternative to other types of acoustical panels. These panels are good for absorbing reverberant sound in homes, auditoriums, recording studios, theaters, gyms, restaurants, hotels, classrooms, offices and many other applications where eco-friendly sound absorption products are required. Acoustic foam panels prevent soundwaves from reflecting off ceilings, walls and other hard surfaces. The foam absorbs soundwaves to create a quiet, calm and pleasant ambience. Acoustic foam also helps to reduce noise from outside sources and prevent them from creeping inside. Foam Acoustic Panels are an excellent option for adding sound absorption to any application. While noise-dampening foam is not soundproof, it masks or cleanses the attenuations, whereby providing you the acoustic solutions for your residential and commercial spaces that are unmatched in quality and cost-effectiveness. It is fast and easy to install, and represents a budget-friendly option. TOP SURFACE supplies genuine wood acoustical panels of European quality that are innovative, dependable, as well as creativity crafted to adorn your wall and ceiling panel. The look and feel of our wooden acoustic panels and the materials are excellent in terms of architectural features and create a modern, pleasing look in any room and enhance it with an acoustically treated solution. Our acoustic panels in wood are state of the art, high class products and we have a large variety in terms of wood veneer types and finishes to meet your aesthetic goals. 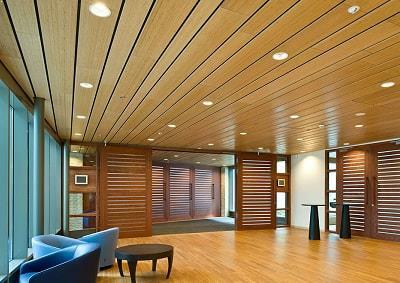 These wood acoustic panel systems are easily installed using the attachments of nail clips onto furring strips or using a T-grid system for the ceiling tiles; the accessories also being part of our product portfolio. They are cut to your specifications to fit your job requirements. Acoustic wood panels reduce noise levels projected by speakers and musicians, and decrease sound reverberations within any building. The panels include a host of high technology features to help absorb and centralize soundwaves to reduce noise levels and echoing. Best in class Sound Absorption: They quiet a space by absorbing and diffusing sound. Better Privacy: The panels enable you to add privacy, confidentiality intimacy to a space. Improved Sound Quality: The panels can help you boost listening and recording quality, along with speech intelligibility. TOP SURFACE wood acoustic panels remain a top choice for those who prioritize sustainability. Wood acoustic panels are available in many sizes, veneers, finishes and patterns, and aument the style and appearance of any area with elegance and sophistication. They can be customized with your project pattern and ceiling- or wall-mounted installations. 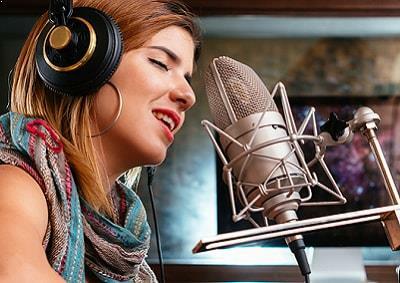 Blocking sound may require more than a single product to efficiently soundproof a room. In addition to installing a sound barrier material, any seams, gaps and doors need to be sealed. When sound is seeping into or out of a room, doors & windows are quite often the problem. They may not have enough density or mass to block the transmission of airborne sound. Additionally, if not sealed correctly, even a 1% opening or gap will allow half of the sound energy to pass through. To help solve these issues, TOP SURFACE acoustical solutions supplies a variety of door and window accessories like acoustic underlay, acoustic wedges, to seal air gaps. We offer a line of high quality, soundproof doors and windows panels that deliver superior performance and maximum sound reduction. Installing TOP SURFACE acoustic solutions will ensure a soundproof wall construction is properly reinforced to block airborne noise. We also provide a variety of door seal kits, acoustical doors seals and window seal kits to reduce sound leakage around existing doors or windows. These are available for use in a wide array of public and private spaces including Offices, Conference Rooms, Home Entertainment, Home Theatre Music rooms, Auditoriums, Teleconferencing, Videoconferencing, Broadcast and Recording Studios, Theatres. Our solutions for acoustic Doors and Windows are specifically engineered for durability and carry excellent sound transmission loss ratings and are precisely designed to meet the soundproofing requirements for architectural, industrial, security applications. Soundproof doors and windows can be supplied as fully factory assembled and are also available with a variety of standard and custom options that provide the most thorough door soundproofing. Door seals can reduce the sound and air transferred through entryways by tightly lining the perimeter of doors. 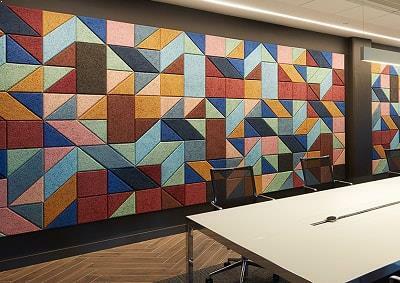 Acoustic panels can be wrapped in thousands of different types of fabric. Fabric-wrapped panels deliver unprecedented acoustical performance. They come in many fabric wrap finishes, sizes and configurations to provide exceptional design potential. There are a variety of colors and textures to meet your design and acoustical needs. Acoustical fabric for wrapping acoustical wall and ceiling panels are designed to absorb sound energy into an acoustical panel, rather than reflecting sound off the surface. With Top-Surface fabric panels, you can reap the benefits of a professional-grade acoustic product. The panels can be mounted to a wall or ceiling with ease, ensuring you won’t have to worry about a time-consuming installation process. Top-Surface sound-absorbing acoustical fabric is made of high quality fiber for durability and ease of maintenance. It is available in a wide variety of colors and its sound absorbing effectiveness allows up to 90% sound absorption while the fabric surface provides a beautiful finish. We offer an endless fabric choices, with patterns and custom fabrics can also be used. Our installations do not require exact site measuring which eliminates delays waiting for prefabricated acoustic panel products and are designed and engineered for sound transmissibility and aesthetic appearance. Moreover, fabric-wrapped panels are made to order, which means you can purchase top-notch panels for any space, at any time. We provide the best sound-absorption panels are fabric acoustic panels. These panels offer outstanding noise control for a wide range of applications and are sold in many sizes, colors and types to address your budgetary and design requirements. Acoustic sound blankets are available in two typical configurations. Sound absorber blankets that absorb sound to reduce noise and absorber-barrier combination blankets that absorb sound and block sound. Both of these blanket configurations utilize high grade and cost effective material for use indoor, or high temperature applications. Most often, these blankets are used to control sound and noise in industrial, manufacturing, and construction but also have various uses in private residential and public commercial applications. Sound Absorption Blankets are used to reduce noise energy or the prevent the reflection of sound waves within hard surfaced environments. These can be used in industrial plants, manufacturing, construction sites and many other spaces like Offices, Conference Rooms, Home Entertainment, Home Theatre Music rooms, Auditoriums, Teleconferencing, Videoconferencing, Broadcast and Recording Studios, Theatres. Sound barriers are materials used to block or soundproof a room or space with noisy equipment. 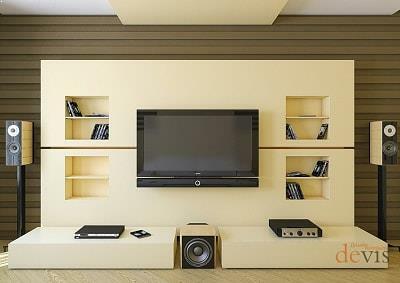 We at TOP SURFACE have various types of sound masking systems, sound proofing solutions and materials for existing and new soundproofing construction. Absorber-barrier products combine multiple materials that will both absorb and block sound. Use these materials to create sound barrier walls or line machine enclosures to reduce noise. Mass Loaded Vinyl is used to reduce sound transmission through walls, floors and ceilings. They are typically comprised of a limp-mass material sound barrier; with a typical weight of 1 lb. per square foot, these barriers are as heavy as lead, but only a fraction thick. This improves the sound transmission loss of a construction assembly without compromising on space. To achieve speech privacy, sound masking systems are regularly explored. These systems broadcast white noise to mask communication and are a convenient low-budget solution. Sound masking actually lowers speech intelligibility, making it more difficult to hear someone speaking. Being exposed to noise for extended periods can also increase worker fatigue and lower productivity, hence, a sound barrier in place between you and the noise source, alleviates these nuances by efficient sound masking. With TOP SURFACE sound masking solutions, you can carry out your conversations without having to raise your voice over a noisy, sound masking system. Acoustics is the interdisciplinary science that deals with the study of all mechanical waves in gases, liquids, and solids including topics such as vibration, sound, ultrasound and infrasound. A scientist who works in the field of acoustics is an acoustician while someone working in the field of acoustics technology may be called an acoustical engineer. The application of acoustics is present in almost all aspects of modern society.This is the science of controlling a room’s surfaces based on sound absorbing and reflecting properties. Excessive reverberation time, which can be calculated, can lead to poor speech intelligibility. Proper acoustic treatment can transform a muddy sounding room with poor midrange definition and erratic bass response into a room with clear, tight sound and is a pleasure to work and listen in. Without effective acoustic treatment, it is difficult to hear what you’re doing, making you work much harder to create a good mix. 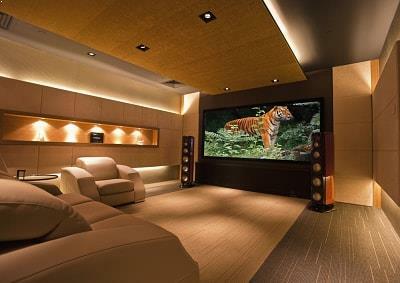 Home cinema, also called home theater refers to home entertainment audio-visual systems that seek to reproduce a movie theater experience and mood using consumer electronics-grade video and audio equipment. For many people looking to improve their entertainment at home, the first goal is creating a more exciting TV- and movie-watching experience. A home theater system attempts to replicate the commercial movie-watching experience in your own home. The auditorium, as a place for listening developed from the classical open-air theaters. 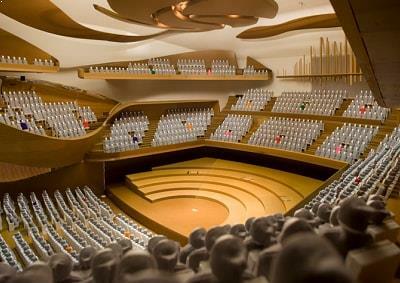 An auditorium includes any room intended for listening to music including theaters, churches, classrooms, meeting halls. The design of various types of auditoriums has become a complex problem, because in addition to its various, sometimes conflicting, aesthetics, functional, technical, artistic and economical requirements, an auditorium often has to accommodate an unprecedentedly large audience. Theatre acoustics are key factors in creating memorable entertainment experiences. Top Surface provides acoustical designs to commercial cinemas and theatres to help ensure captivating performing arts events, movies, and multi-media presentations from the cinema screen and theatre stage. We provide services to perform at arts centers, community theatres, commercial movie theatres, recital halls, amphitheatres, cinema complexes etc. Top Surface provides a well-known brand of acoustics floors with a high specification, and are independently tested and proven, with many proprietary finishes. Top Surface provides a range of specialist acoustic suspended ceilings, that are designed to acoustically enhance the overall separating floor construction. 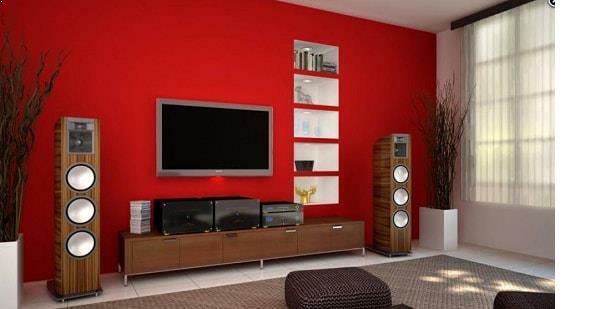 With high levels of sound insulation, correct acoustic ceiling system and with appropriate acoustic floor system. We offer attractive and hardwearing tufted carpet tiles in various pile constructions and textures, designed to deliver specific aesthetic and performance benefits.